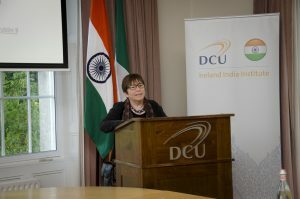 On Wednesday 24 May, Professor Eileen Connolly, Director of the Ireland India Institute, hosted an event on ‘Sustainable Lifestyles: Yoga and Indian Traditions’, in partnership with the Embassy of India. 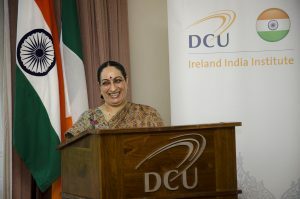 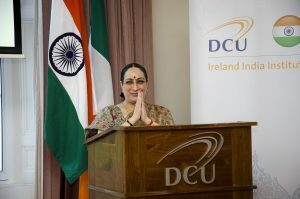 The Ambassador of India to Ireland H.E. 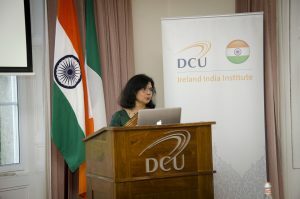 Vijay Thakur Singh presided over the event where the ICCR Professor Anjoo Sharan Upadhyaya delivered an ICCR lecture on “Peace Trajectories and Yoga”. 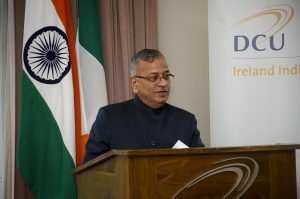 the Vice-Chancellor of Banaras Hindu University, Professor Girish Chandra Tripathi, was the Guest of Honour. 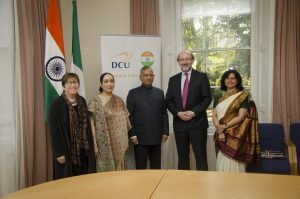 Brian MacCraith, President of Dublin City University welcomed our distinguished guests.